I have always seen the process of negotiation as a means of reaching an agreement, in which both sides must be prepared to compromise on their demands. Perhaps one side does better than the other – gains an advantage – but in successful negotiations both sides must feel they are gaining something. 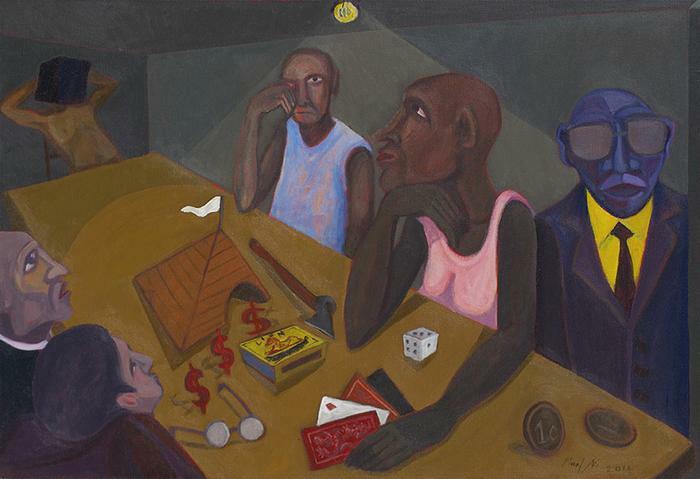 This painting is an interpretation of a bitter labour dispute, and the scene is of a negotiation process between workers and employers regarding salaries. The workers, seated on one side of the table, demand a salary increase, while there is an on-going strike. In the confrontation, they lay down their cards and will not budge on their offer. In the past, many strikes and negotiation processes have taken place in South Africa over various labour issues; the more prevalent ones in the mining industry in which workers earn poor wages whilst mine CEOs are awarded huge salaries and bonuses.